“Downtown” Queensborough was not immune from the election signs that have blanketed the countryside for the past two or three months. Happily, by the end of the day yesterday – the day after the municipal election – they were pretty much all gone. 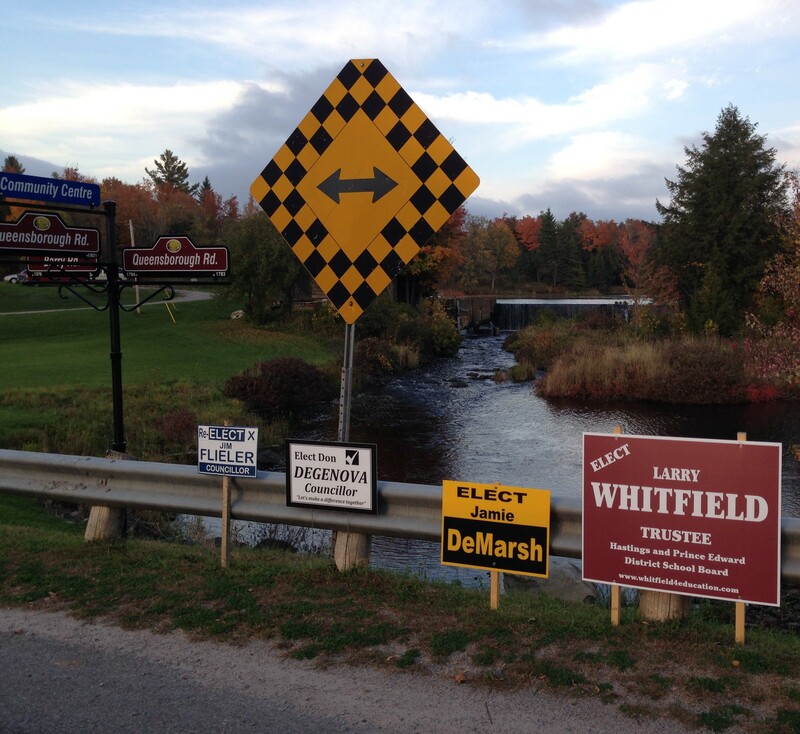 As it happens, every candidate whose sign is in this picture, which I took a month ago, was elected on Monday night. Congratulations to them! Well, Ontario’s municipal elections are finally over. Yesterday morning as I was driving to work, I saw a man collecting election signs from the side of the road and loading them into his pickup truck, and I had to restrain myself from getting out of the car and racing up to shake his hand in gratitude. I think I speak for pretty much everybody when I say that after what seemed liked six months of looking at those signs all along the highways and byways of pretty Hastings County, I was thoroughly sick of them. And then late this afternoon I had another very pleasant post-election experience, this one even more pleasant because it was unexpected. There I was in the fading daylight, raking up the leaves from one section of the Manse’s yard, when an unfamiliar pickup truck (I think I know all the pickup trucks in Queensborough by now) stopped in front of the house and a young man got out and headed toward me. I didn’t recognize him from a distance, but when he said, “Hi, Katherine!” I realized it was newly elected Municipality of Tweed Councillor Jamie DeMarsh. He’d driven up to Queensborough from Tweed, where he owns a small business, to say thank you to the voters! People, I have to tell you that’s a first for me. Usually politicians, or would-be politicians, are all over you when they’re running for office, what with the telephone calls and the door knocking and whatnot. But to come around to the relatively small number of voters in our little hamlet, right after the election, and say thanks in person? How nice is that? Brand-new Municipality of Tweed Councillor Jamie DeMarsh. I could tell from my conversation with him today that he is excited about his new responsibilities and is raring to get at the job. Jamie and I had met at the recent all-candidates evening held at the Queensborough Community Centre, which I wrote about here. As I told him this evening, he spoke very well that night, and I am pretty sure picked up a few votes thanks to his obvious interest in the issues that matter to the people of our little hamlet, which is a very small part of what I like to refer to as the Greater Tweed Area. This evening he told me he’d been sick that night with a really bad cold, which to my mind made his performance all the more impressive. We moved on from that to a fresh discussion about some of the issues that matter to the people of Queensborough. What a treat it was to have the ear of one of our municipal representatives! Right there on my front lawn! Jamie told me he is determined to be an accessible councillor, and will make visits regularly to our hamlet and the others (Stoco, Marlbank, Thomasburg, Actinolite) in the larger municipal area to see what’s on voters’ minds and stay in touch. At the end of our 15-minute conversation – when I had to get back to my leaf pile because it was getting dark – I was, let me tell you, feeling pretty darn good about rural politics. About one of my elected councillors knowing me by name, knowing the local issues that matter to me – and taking the trouble to stop by and say thanks. And obviously when he stopped by he didn’t even know whether I had voted for him. But Jamie, I’ll let you in on a secret: I did. I was impressed by what you had to say at our all-candidates night – and I’m even more impressed now. Here’s to a good four years of municipal governance, with our politicians staying in touch with the people they represent! Well! Now that the big annual St. Andrew’s United Church Turkey Supper has come and gone and we’ve all been well fed once again, it’s time to turn to the next major event coming Queensborough‘s way. That would, of course, be the all-candidates night this coming Monday, Oct. 6. 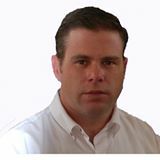 Now, as a journalist who spent many years covering municipal politics in Ontario, I can tell you with assurance that oftentimes municipal elections don’t attract much interest. 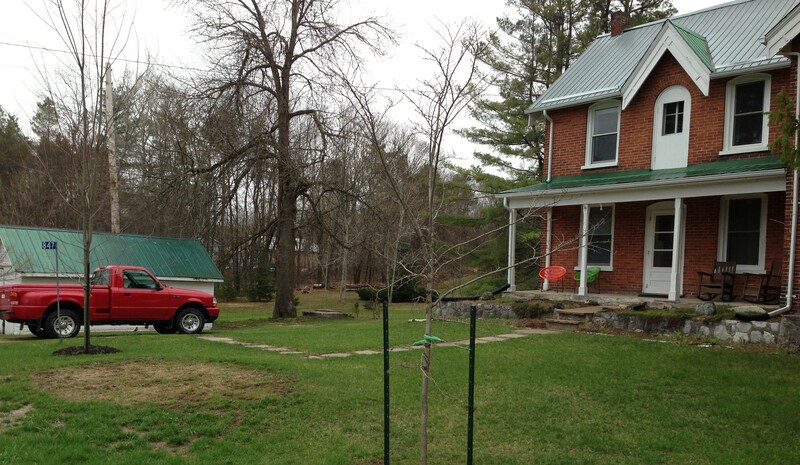 For whatever reason, this year is different – or at least it is in our part of Eastern Ontario. For the past many months – since way before you’d expect people to be even thinking about this stuff – I’ve overheard and been involved in conversations with ordinary people about who might run for office and what issues need to be tackled. This extraordinary level of interest isn’t just being shown here in the GTA (Greater Tweed Area) of which Queensborough is a part; it’s also happening in Centre Hastings (a fancy name for the village of Madoc and the township to the south of it, Huntingdon), in Belleville (where there are seven candidates for mayor alone) – why, even in sleepy little Madoc Township right next to us here in Queensborough, all kinds of people have stepped up to challenge the incumbents. Although our mayor, Jo-Anne Albert, has been acclaimed because no one challenged her, the race here in the Municipality of Tweed is not short of entrants. And that’s where the all-candidates night comes in. 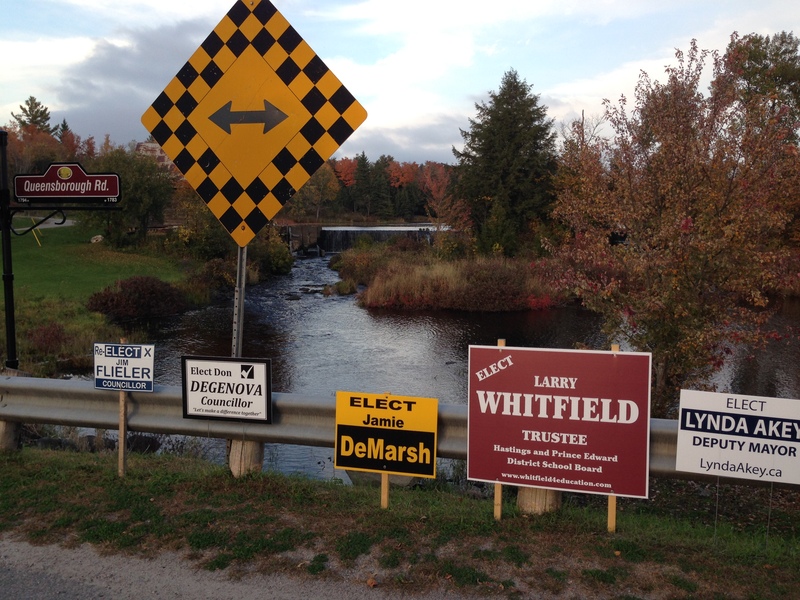 Even our quiet little hamlet is awash in campaign signs, as you can see here at the main intersection in “downtown” Queensborough. 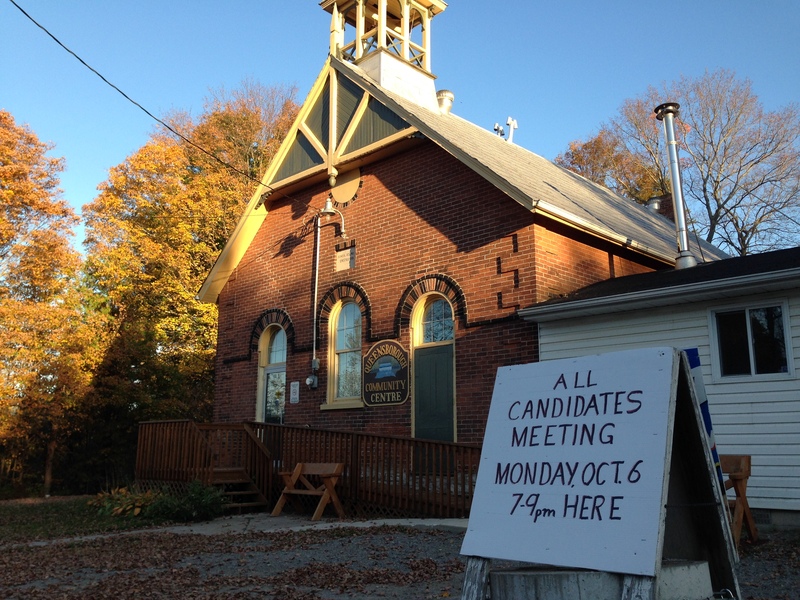 From 7 to 9 p.m. this coming Monday, the candidates are invited to come to the Queensborough Community Centre (our historic former one-room schoolhouse), say their piece, and more to the point answer the questions that we local residents have for them as we try to reach a decision on whom to cast our votes for. I am tickled that this has been organized in Queensborough (no thanks to me, by the way, though you can be sure I’ll be in the audience). It’s one of only two all-candidates nights to have been set up throughout this whole sprawling municipality, which includes the village of Tweed (where the other all-candidates night is taking place even as I write this) and the townships of Elzevir (that’s us here in Queensborough), Grimsthorpe and Hungerford (where other hamlets, including Stoco, Marlbank and Thomasburg are located). I think it is outstanding that little Queensborough should show such interest in municipal matters. Anyway. I expect there’ll be a good turnout and some lively discussion, and I am wholeheartedly looking forward to it. I hope to see lots of fellow voters there! Yes, I can (occasionally) throw old things out. I post this photo only to show those of you who’ve been reading this blog long enough (or know me well enough) to suspect that I am a hoarder of things from my past. Sure, I’ll grant you that I tend to keep stuff that I think might be of interest at some point in the future, or that holds sentimental value for me. And yes, there are times when it does seem like our household has a few too many such things in it. But I can throw things away! Sometimes. Witness our rusty, squeaky old mailbox, shown here just after Raymond and I had deposited it at the Tweed dump (which is actually in Stoco) and just before we drove off. I mean, talk about sentimental value! I am pretty sure this was the mailbox my father erected way back in the days when my family lived at the Manse and I was growing up here. That it’s the very mailbox that we kids had to shovel out whenever there was a snowfall, to make sure the mailman could get at it. And there’s not only the long-ago sentimental value; there’s also the fact that this is the mailbox that, in early 2012, first told the world (or Queensborough, at least) that Katherine Sedgwick and Raymond Brassard were the proud new owners of the Manse. But like I said, the mailbox was pretty rusty and squeaky; when we opened it to check the mail I’m pretty sure everybody in Queensborough could hear it. And so we decided we should get a new one, and we did. And it too now bears the names Sedgwick/Brassard so that the world knows where we live. The old one sat in the Manse’s back porch for many months, but about a month ago we decided its time had come. And off it went to the dump. I am very proud of myself for letting it go, and thus clearing out the space it occupied. There’s a lot more of that kind of thing that needs to be done around here. Of course I do. But only a little bit. Thomasburg, as you may or may not know, is one of five hamlets in the municipality of Tweed (or, as I like to call it, the Greater Tweed Area) – the others being Queensborough (of course), Actinolite, Stoco and Marlbank. All are tiny and pretty, though you can readily guess which of them is closest to my heart. Until very recently, Thomasburg was the hamlet I was least familiar with; I’d heard about it all the years I lived in Queensborough as a kid, back in the 1960s and early ’70s, but had never actually been there. One recent sunny early-summer day, though, Raymond and I made an excursion down Highway 37 south of the village of Tweed to Thomasburg and poked around it a bit. It’s a hamlet chock-full of interesting old buildings, including some very handsome 19th-century homes. 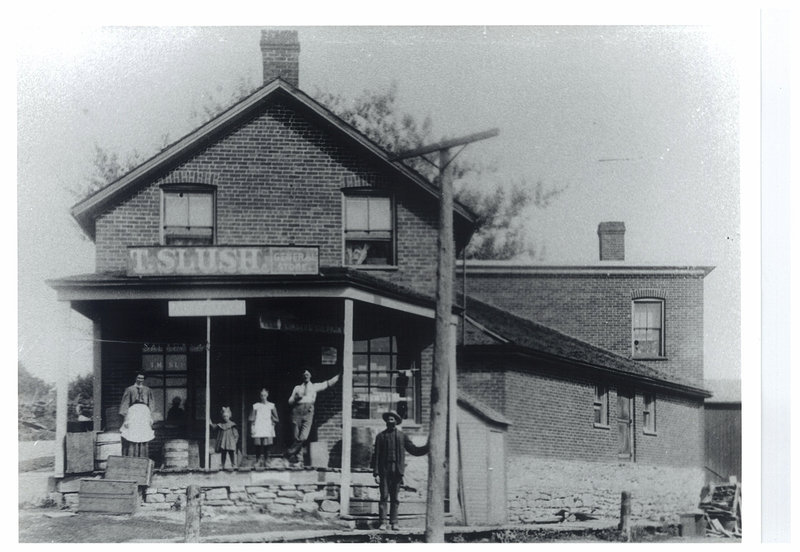 A couple are so large as to suggest that they once served as hotels – a reminder of the long-ago days when a trip from, say, Belleville north to Tweed was a long and arduous affair, and people might have needed to stop for refreshment or, if it were late in the day, for the night. One thing we agreed during our little tour around Thomasburg was that it would have been helpful had there been some sort of a sign, or brochures available at a central location, giving a bit of the history of what is clearly a historic little place, and perhaps explaining what some of the buildings used to be. And now, lo and behold, I have discovered – thanks to correspondent Carol Martin, who lives in Thomasburg – that the Thomasburg Beautification Committee is engaged in the project of erecting just such a marker at the Thomasburg Hall, with a short text about the hamlet’s history that Carol is writing, and some historic photographs. How great is that? Now here’s where you come in, readers: the Thomasburg Beautification Committee has been able to unearth a few vintage photographs of the hamlet (thanks to the Tweed and Area Heritage Centre, and they’ve also checked with the Hastings County Historical Society), but they would love to have some more. So: do any of you out there by any chance have any old photos of that pretty little hamlet? Or do you know anyone, or any organization, that would? If so, Carol would love to hear from you at cjmartin.thomasburg@gmail.com. And my thanks (and Carol’s) in advance if you can help out with this excellent project that preserves and celebrates the history of one of the lovely little corners of Hastings County! That is one shiny trailer hitch. 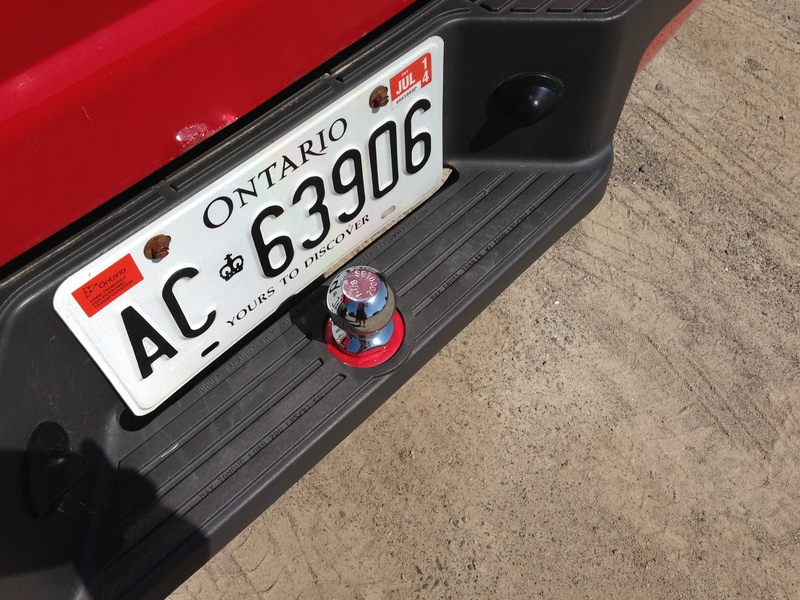 I bet you wish you had a nice shiny new trailer hitch like Raymond (Red Truck Ray) now has on his red truck. Next step: acquiring the trailer to go with it. Okay, so we haven’t got the trailer for Raymond’s red truck yet. We still have trailer envy (I wrote about that here), which will get much worse the next time we need to take a big load of stuff (bags of yard rakings, for instance) to the Tweed municipal dump at Stoco. That said, neighbours have been kind enough to offer to loan us their trailer if we need it, and since it seems like everyone in Queensborough – except us – has a trailer, we should be just fine for that dump trip. But eventually we will get a trailer of our own, and then won’t we be sitting pretty? And meantime, at least Raymond has taken the first step, which was to acquire this nice shiny trailer hitch from our friend and neighbour Chuck. Because Chuck just happened to have a spare trailer hitch on hand. That’s the kind of thing people just have in Queensborough. Which I happen to think is delightful. Not to mention convenient for neighbours needing trailer hitches. 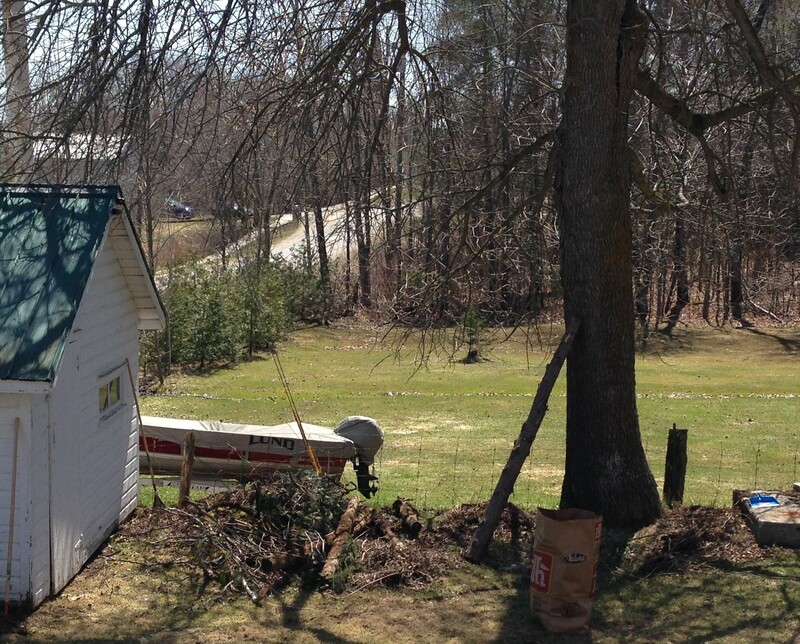 A scene showing all the debris I raked up from one small section of the Manse’s yard. When we were finished, we had 20 of the big paper bags like you see in the photo full to overflowing. And now all that material has a new home! We got an email from our Queensborough friend and neighbour Chuck late last week that absolutely made my day. It was just the perfect example of how people in a small community, where everyone knows everyone else, help each other out and figure out ways to do things that are mutually beneficial. As I’ve mentioned in a couple of recent posts, like here and here, Raymond and I worked hard during our last visit to the Manse to get all the leaves and other fall/winter detritus raked up from our big yard so that it would be all set for when it’s time to start mowing the grass. And as I wrote here, our ending up with 20 big bags of yard waste stowed in the garage awakened a deep longing in me (and, I think, in Raymond too) for a trailer to hitch onto the back of his red truck. 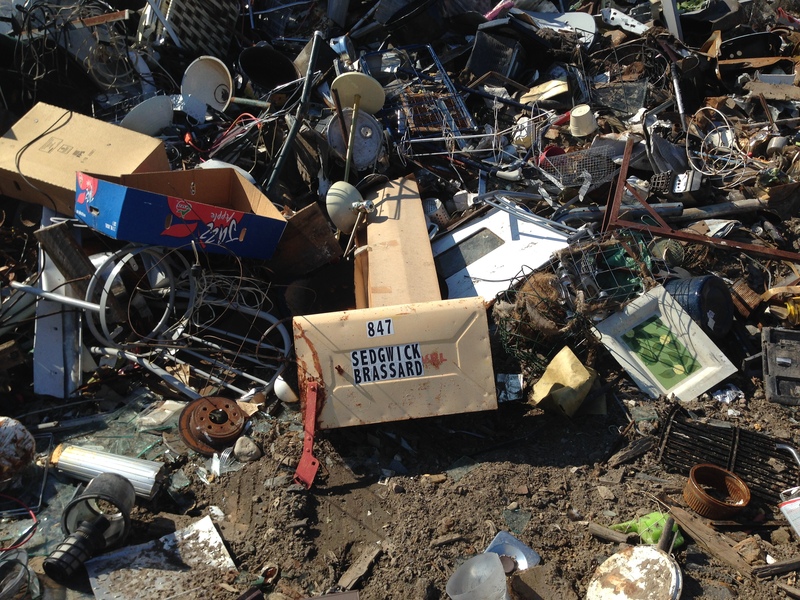 That way we would have been able to dispose of it all in one big dump run, rather than having to cover the not-insignificant distance between Queensborough and the Municipality of Tweed‘s dump near the hamlet of Stoco two or more times. But we don’t (yet) have that trailer, so multiple fossil-fuel-burning dump trips loomed. Chuck was emailing to tell us that another neighbour is looking to collect all the yard waste he can to fill in some low, water-logged areas in his own yard. Could he have ours? Well, he most certainly could! And not only that: Chuck volunteered to arrange to get the 20 bags out of our garage and over to our neighbour. So the next time we get to the Manse, it’ll all be gone. I just love that: one household’s waste turned into another household’s useful stuff. All thanks to conversation and co-operation among Queensborough neighbours. Grey skies over the Manse early this morning – which meant it would have been a great day for staying inside and doing some historical research on Queensborough. As you can see from my photo, it was an overcast (with gusts to drizzly) morning at the Manse today. And with more rain in the forecast, it would have been a perfect day to curl up in front of our cranberry-red electric fireplace with my treasured copy of the history book Times to Remember in Elzevir Township and do some research for a project I have volunteered to help with: the creation of a flyer outlining a walking tour that will give visitors to Queensborough information about its history and some of its buildings. A related project that I also think is a splendid idea, and for which I have also volunteered to help with the text, is a marker at the centre of town, down by the picturesque Black River, outlining a little bit of Queensborough’s history. That way all those who stop to admire (and often photograph) the village will get some sense of the past and present of what they are seeing. The need for something like this was reinforced in my mind this past week, when Raymond and I did some touring around rural Hastings County. There are many interesting-looking little hamlets and villages (though none, in my very biased opinion, as pretty as Queensborough), but by and large there is nothing in them to tell the visitor a single thing about them. What’s the story on Thomasburg? Moira? Millbridge? Gilmour? Sulphide? Cooper? Stoco? Bannockburn? You go through them and you’d never know, and I think that’s too bad. So I hope we will get these projects off the ground. And if I can just get some rainy-day time at the Manse to do my part, well – I will be very glad to do so.